AGAWAM — With a click . . . click . . . click, the Wicked Cyclone roller coaster car slowly rises 112 feet into nothing but sky. As it levels at the top, riders get a quick view of the Six Flags amusement park and the treetops of Agawam beyond. Then, the car drops at a 64-degree angle, propelling its 24 screaming passengers along a twisting track with two “zero gravity” corkscrew rolls and a turn that banks at an unprecedented 200 degrees. Once the rickety wooden cousin to the park’s steel coasters, the 32-year-old Cyclone has been remade and renamed. Topped with a new type of metal track, the Wicked Cyclone is one of five such wood-steel hybrid coasters in the country. Now, the ride rivals the park’s sleek Bizarro as a favorite of both casual riders and a community of devotees known as coaster enthusiasts. Chrys Garber now counts herself among them. A full-time mother from nearby East Longmeadow, she stood in the Wicked Cyclone line with her kids on a sunny, late June afternoon. Garber said she’s ridden at least 40 times — pretty much every day since the ride reopened in late May. The network of organizations, websites, and social media feeds produced by coaster fans buzzes with news and reviews of the Wicked Cyclone. American Coaster Enthusiasts, a 40-year-old group that counts more than 5,000 members, held an ERT event (for “exclusive ride time”) at the park in July. Fans have been posting reviews on Twitter feeds with names like Screamscape, the Coaster Critic, and Coaster Insanity, which dubbed the Wicked Cyclone a “favorite new ride of this year.” The team at sfneonline.org, a website started by coaster fan A. J. Lewis in 2005, writes and tweets about Six Flags and other New England amusement parks. While not officially affiliated with Six Flags in Agawam, members spend a lot of time there. This winter, Lewis and others showed up in the cold and snow to document the reconstruction of the Cyclone. So did sfneonline.org writer Zach Acquafresca, who rode it 10 times during a media-only day. He wrote on the site that the “coaster has the perfect amount of everything; from the hang time, to the airtime, the lateral and positive forces, and the inversions.” In non-coaster terms, that means riders soar, spin, bank, drop, and twist at speeds up to 55 mph for a minute and a half. All without a shoulder strap. Some pay for that feeling with their keys, phones, or sunglasses, which, unlike passengers, tend to fly out during the ride. 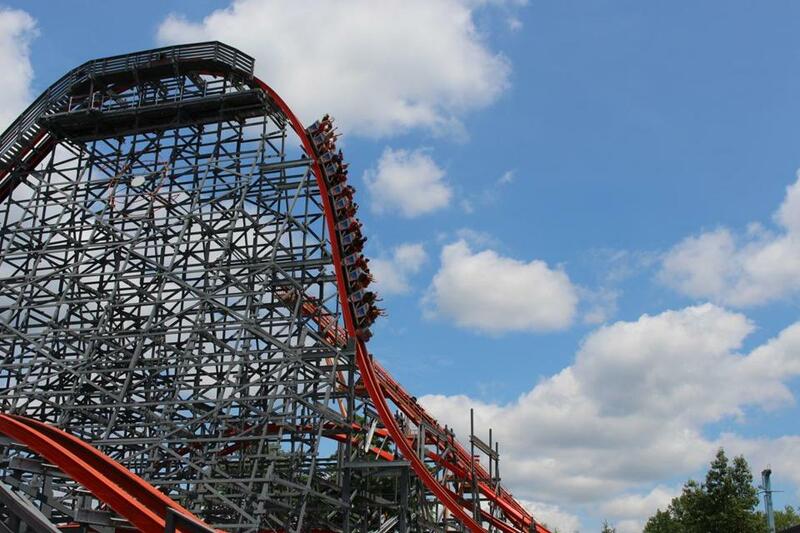 Six Flags’ Wicked Cyclone in Agawam is one of five wood-steel hybrid coasters in the country. This is one of its overbanks. One of those kids was Matthew Keegan, 8, of Milford, who marched down the ramp with a slight weave in his step after his first ride. He said he liked it, but hesitated before saying he wasn’t scared. Keegan admitted that he was frightened when the car took its plunge. The designer of the original Cyclone would be pleased to hear that. 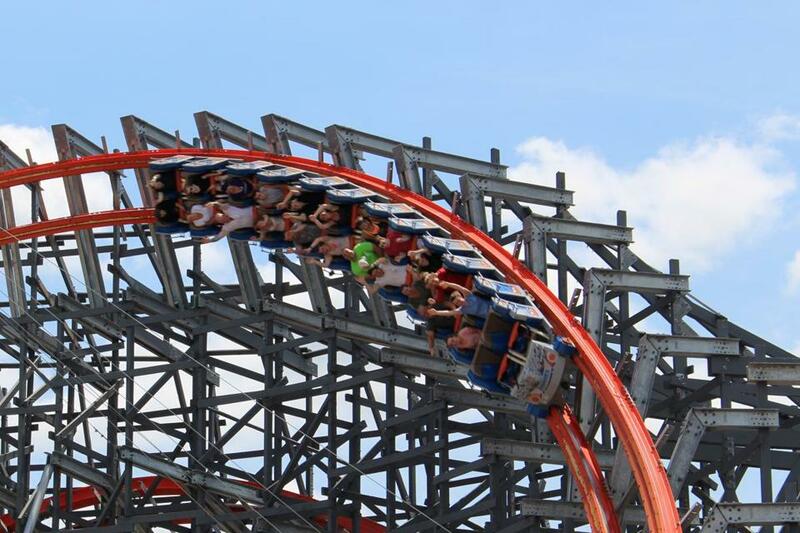 A veteran coaster engineer, the late William Cobb copied the Coney Island Cyclone when he created the new wooden coaster for what was then Riverside Park in 1983. For a family-owned operation, it was a big investment at $2.5 million. With a 96-foot rise, it was one of the biggest of its time. The Coney Island coaster, which was originally built in 1927, was slated for destruction in the 1970s. But fans rallied, and it is now on the National Register of Historic Places. The Agawam coaster has no such protection, and last summer, Six Flags shut it down with no public plan to reopen. However, by the end of the 2014 season, the park announced that the Cyclone would become the Wicked Cyclone. A bit shorter than the original, it was designed to offer the same smooth ride as hybrid coasters in California and Texas with names like Twisted Colossus and Iron Rattler. Coaster designer Alan Shilke and the team at Rocky Mountain Construction are behind this coaster and four hybrid coasters at other Six Flags parks. Shilke said the key lies in a track technology they designed. The selling point to the parks: The tracks require less maintenance than traditional wooden ones. For thrill-seekers, the steel-mounted track offers a faster, smoother ride. Not that the old Cyclone wasn’t thrilling. Shilke said he tries to make his revamped rides more exciting than the original. This one offered a challenge. Tim Baldwin of American Coaster Enthusiasts agrees. He said the Agawam Cyclone was one of the last coasters designed by the now-legendary Cobb. Speaking from the group’s convention in Atlantic City, Baldwin said some of the older wooden coasters are being torn down, and the group has many members who are lamenting the loss of the traditional rides. Baldwin thinks the hybrid is the answer. Tinker Ready can be reached at tinkerr@comcast.net.